There is an ancient method for charting fertility that will end the pain, expense and disappointment many women endure in their desire to conceive - and the moon is the key. The principle is simple: A woman ovulates whenever the moon is in the same phase it was in at her birth. For instance, if you were born during the new moon, you have the potential to ovulate during the new moon every month. His research culminated in the opening of a fertility clinic in Czechoslovakia that quickly thrived as word spread internationally. But it all came to a sudden halt in the communist crackdown that shortly followed. Fortunately his promising research and clinical success has led to more awareness and use of the lunar fertility method, though unfortunately not nearly enough. With that fact in mind, I would like to add my voice to the small but growing chorus singing its fertile praises. Like Dr. Jonas, I’m an astrologer. So I naturally used the lunar fertility method to successfully plan my three children. I feel fortunate to have learned of this method, but I wish I’d made a greater effort to spread the good news, because now I see how badly it’s needed! I got a wake up call when I recently began reading about women over 40 who, like myself, wish to conceive (again:). I soon became aware of the all-pervasive negativity women over 40 are confronted with when expressing this desire. This clearly leads to profound self doubt that, in my opinion, makes you vulnerable to the overblown promises of painful, expensive procedures like IVF. Once I experienced this negative pressure firsthand during a visit with my (ex) physician, and read the many similar experiences at MothersOver40, I knew I had to share what I know. So I wrote to Jan Andersen, who kindly offered this forum to do so. combined calculation further increases the likelihood of conception. 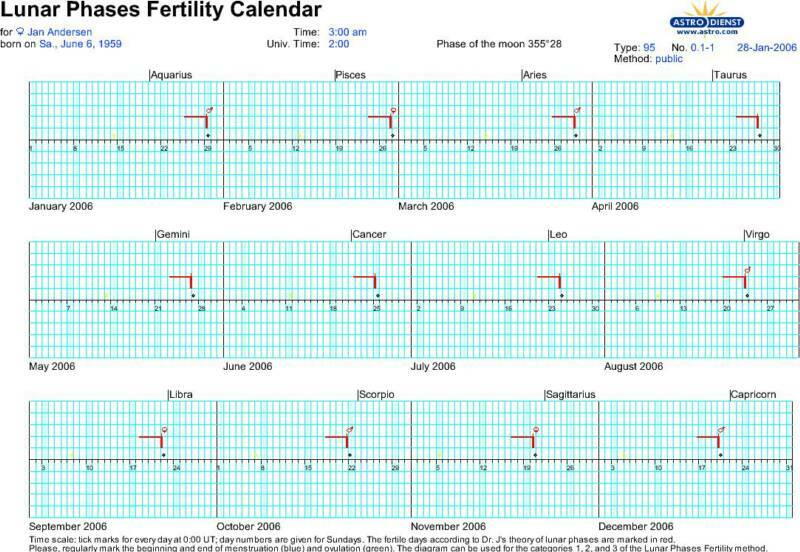 Concerning contraception, a second, fluctuating ovulation cycle related to the menstruation cycle has been observed by researchers, so a lunar fertility chart is not a fully effective contraceptive method. For conception, however, it has a 98% success rate! Equally amazing, yet perfectly in keeping with nature, is that the lunar fertility method predicts a baby’s gender. Again, it’s very simple: when the moon is in a positive zodiacal sign, it’s a boy; and when the moon is in a negative zodiacal sign, it’s a girl. So, though the man’s sperm carries the x & y chromosomes that determine gender, the woman’s biochemistry, in sync with the moon, determines which of the two get through and when. And every month it alternates, so it’s a perfect balance of potentials. So the choice is truly yours - as long as you’re aware you have one! 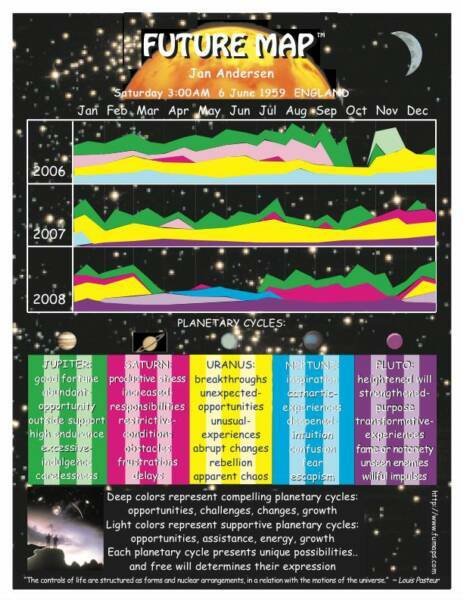 * A man's lunar fertility chart can also be calculated to maximise a couple's chances of conceiving. I recommend the book ‘Astrological Birth Control’ by Sheila Ostrander & Lynn Schroeder. It's very comprehensive, and though it was written in 1972 and is now out of print, there are currently a few copies available on Amazon. However, the book is not necessary to calculate a fertility chart. A planetary ephemeris and a little mathematical skill is all you need.